In a musical world where indie pop darlings seem to spring up every day, Frankie Cosmos, the brain child of Greta Kline, have carved out loyal following for their heartfelt, honest, and hook filled songs. Kline (the daughter of actors Kevin Kline and Phoebe Cates) began releasing lo-fi recordings online in 2011 as a teenager under the moniker Ingrid Superstar – a fake name she hoped would give her anonymity online (a year later she changed her stage name to Frankie Cosmos). Over the next three years she continued to churn out teenage inspired lo-fi, developing her craft as a songwriter. It wasn’t until 2014 when she released Zentropy with her then boyfriend Aaron Maine of indie rock band Porches that her musical profile quickly emerged beyond online. The raw and intimate 17-minute recording, her first in a studio and with the help of a band, showed the promise of a young songwriter just beginning her career. Raw, interesting and hooky songs feeling like two minute bursts of wonder, it was surprising recording and one that instantly gained her a following, especially for those inspired by the K Records ethos. Kline released the EP Fit Me In in 2015, and Next Thing the following year which landed her at No. 13 on the Billboard Heatseakers charts. She toured often and continued to grow as a songwriter. Now a four piece that includes Lauren Martin on keys, Alex Bailey on bass, and Luke Pyenson on drums, Frankie Cosmos recently released Vessel on Seattle’s own Sub Pop Records to critical acclaim. As for the move to Sub Pop, Kline believes they’re the right fit for her. “They’re legendary and everyone there is really great, and we felt it was time to have a team devoted to helping manage all the different parts of releasing an album,” she said. With the release of Vessel, Kline has hit the road which will take her to Bellingham this month (for the first time) then back on the road through the rest of the year and into 2019. “And then hopefully we will have some time to work on a new record soon!” she added. 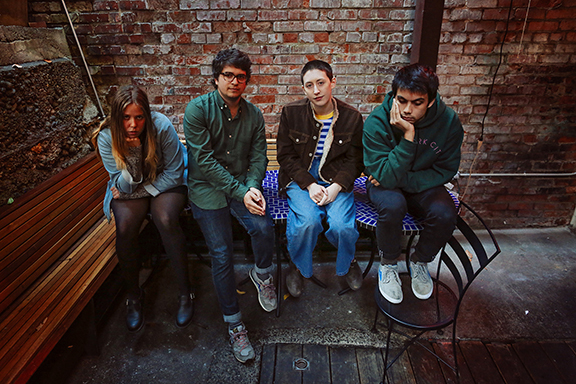 Frankie Cosmos performs at WWU on Nov. 11. For more about the band, visit frankiecosmosband.com.